Cooking is my passion. It is one activity at which I can spend a great deal of time and effort and leave the endeavor feeling thoroughly refreshed. This is a collection of recipes, menus, restaurant reviews, and so on. Enjoy! We're lucky in San Francisco to not only get a great set of food pages in the San Francisco Chronicle every Wednesday, but to also get a wonderful Wine Section on Fridays. There are not only articles about wine, cocktails, and beer, but similar treatments of cheeses, and main courses matched with the wines being featured. The following recipe was paired with various Pinot Noir, and we served it to company, who loved it. It's delicious! Insert the slivers of Garlic and Ginger into the meat. Process the garlic and Ginger in a small food processor, producing a thick paste. Set aside 2 Tablespoons of the paste. 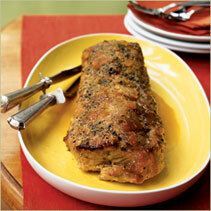 Rub paste onto meat and let sit for 2 hours at table, or overnight in the refrigerator. Sear the meet on stove top top in oil or butter. Place in roasting pan, and roast for 30 minutes. Take out of the oven and let rest under a foil tent for 15 minutes. 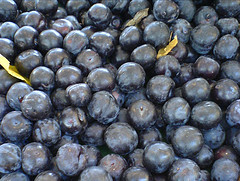 12 French (or Italian) Plums, pitted and halved. Add Plums, juice, soy, wine, and brandy (if used), simmer covered for 15 minutes. We have a custom in our home. Every Sunday evening, if possible, Anna joins us for dinner. We start off with drinks and cheese or pate and lots of conversation. Then we sit down to dinner, where the conversation continues. The difficulty and challenge lies in Anna's vegetarianism. Being a confirmed carnivore, I have to scramble to know what to prepare. Often times I will play in the kitchen, testing out ideas on Arthur and Anna. These two items came out of my head a couple of weeks ago, and I thought I'd share them here. Preheat your oven to 400°. Wash the tomatoes and halve them. 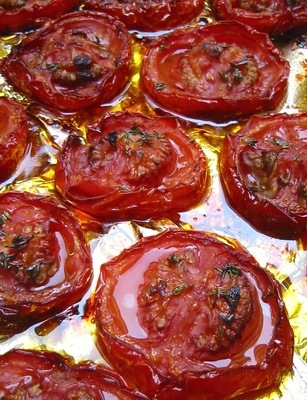 Place them in a metal baking pan oiled with 1 tablespoon of the olive oil. Cut the onion into quarters and place into the pan as well. Salt and pepper the tomatoes and onion to taste, and you may add herbs (Provence, thyme, marjoram, dill or a combination) at this point. Drizzle remaining olive oil over the vegetables. Place in the oven and roast for 20 minutes or more. When tomatoes and onions are done to your liking, remove from the oven and let come to room temperature. Place the tomatoes individually into a soup pot, removing the skins as you do so. Remove the onions to the soup pot as well. Place the baking pan on a medium burner, and deglaze the pan with the wine. Pour the juices into the soup pot. Add the chicken stock, and sugar and bring to a boil over high heat. Reduce the heat to medium-low and simmer until the liquid is reduced by one quarter, about 20 minutes. Cool for 10 minutes. In a blender, puree the soup in several batches until smooth, 2 to 3 minutes per batch. Strain into a clean pot and bring to a simmer over medium heat. Turn off the heat and stir in the heavy cream. Season to taste with salt and pepper. Reheat gently over low heat. Ladle the soup into bowls and serve with a fresh loaf of artisanal bread. Preheat oven at 400°. 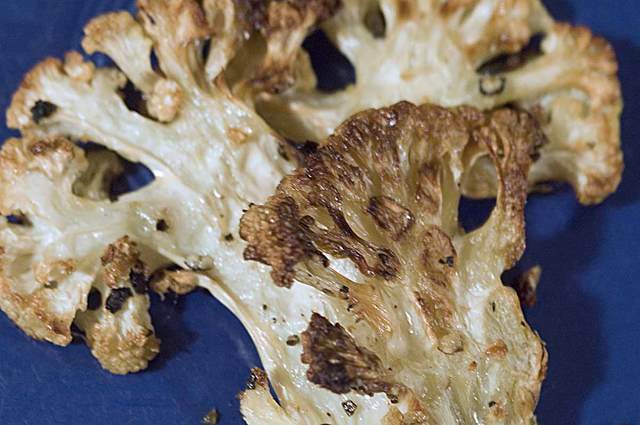 Place cauliflower florets into a bowl along with the garlic, olive oil, salt and pepper. Toss with a spoon so that the florets are coated with oil and garlic. Place the florets into a glass baking dish, and bake for at least forty minutes or to taste. While the cauliflower is roasting prepare the sauce. Boil first 6 ingredients in medium saucepan until liquid is reduced to 3/4 cup, about 20 minutes. Add cream; boil until liquid is reduced to 3/4 cup, about 5 minutes. Strain sauce into small saucepan. Bring to simmer. Remove from heat. Gradually add 5 tablespoons butter, whisking just until melted. Season with salt and pepper. NOTE: The cream and butter tend to obviate the curry, so you may need to add more, depending on your taste. Be certain to test the sauce to make certain that it is as hot or as mild as you desire. Place the hot-roasted cauliflower in the middle of a soup plate, and spoon the sauce around the florets. Serve immediately.